BLUE is a gorgeous boy. He likes to keep his kennel clean and has excellent doggy manners. He will stand calmly whilst getting his lead on and is very easy to walk, happily walking beside you on a loose lead. 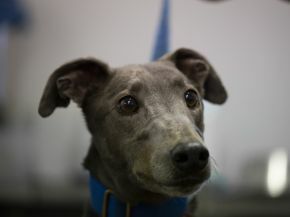 He is very relaxed around the other greyhounds and enjoys lying in his bed observing kennel life. He is very friendly with people and loves it when people stop by his kennel and give him some attention. He is a quietly confident boy who will make a superb pet.